Tron is creating a platform to build a decentralized internet. This platform is powered by the TRX coin. Now, you’re on this guide because you want to buy Tron to either make a quick profit, or because you believe in TRX long term. Regardless of what your motives are, you’re at the right place since this guide will show you exactly how to buy Tron. After launching in 2017, Binance quickly climbed the ranks to become the most popular cryptocurrency exchange, easily eclipsing its rivals in terms of liquidity, asset selection and trade volume. Besides its extreme size, Binance is also one of the fastest exchanges in operation, capable of handling around 1.4 million transactions per second, while its extremely low fees make trading at Binance particularly attractive, even for small traders. As it stands, Binance offers eight TRON (TRX) trading pairs, with TRX/BTC and TRX/USDT being by far the most popular, often achieving around $10 million in daily trade volume. 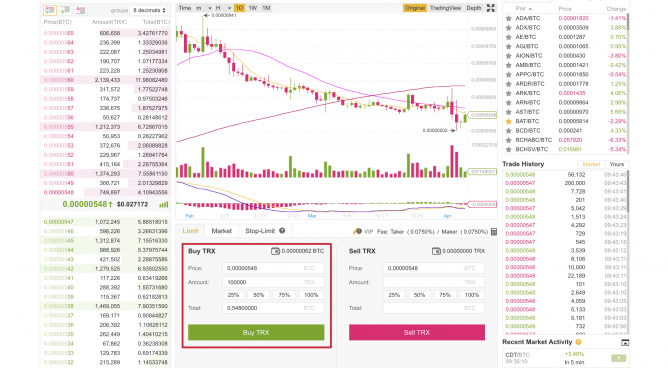 In addition, TRX can also be traded against BNB, ETH, XRP, TUSD, USDC, and PAX, giving Binance users an excellent range to choose from. Binance was designed to be both user-friendly and efficient, and is widely considered to be one of the easiest exchanges to use for new traders. 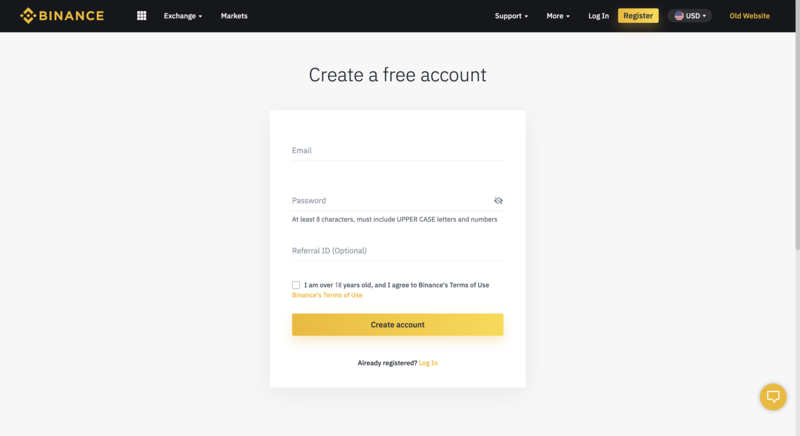 To get started with purchasing Tron, you’ll need to first create an account on Binance. When registering, you’ll be asked to provide your e-mail address and a secure password you’ll remember. You will be sent a confirmation e-mail that you need to click to activate your account. Once you have confirmed your account, we recommend setting up both SMS Authentication and Google Authentication to improve its security, these can be found in your account control panel. 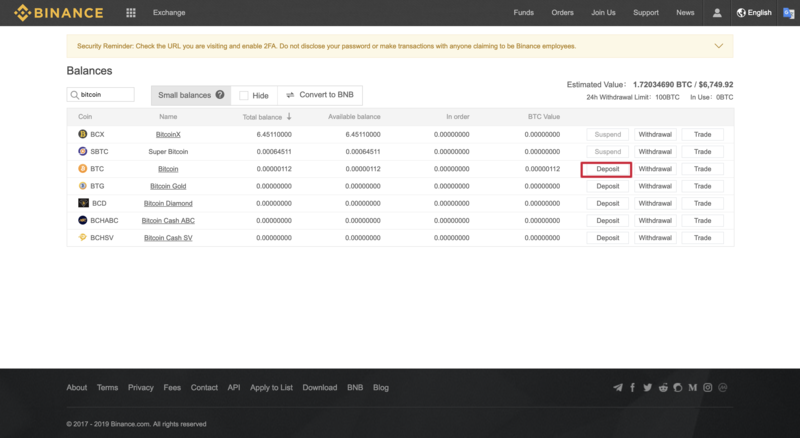 Being a purely crypto exchange, Binance does not allow fiat deposits or withdrawals. While this may be an inconvenience for some, it does allow Binance to be much less demanding in terms of identity verification, only requiring full ID verification if you want to withdraw more than 100 BTC per day. In order to create a Tron buy order on Binance, you’ll first need to deposit Bitcoin (BTC) or Ethereum (ETH) to your account balance. To do this, simply log in and navigate to the ‘Funds’ section, before selecting ‘Balances’. In the deposits panel, you will be able to access all of your different cryptocurrency deposit addresses. 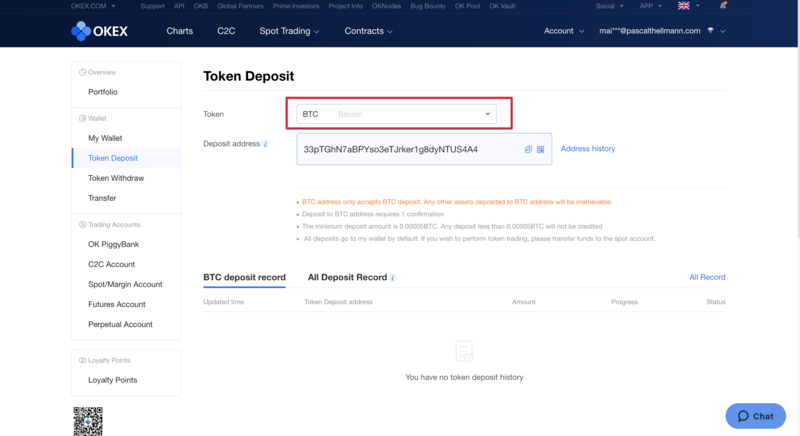 Here, use the search bar on the top left to search for either BTC or ETH, depending on which one you intend to deposit — this will then allow you to select ‘Deposit’ which will take you to a page displaying your unique BTC or ETH deposit address. Now, you’ll need to use this address to make your deposit using your external client. For BTC, these deposits will show in your balance after 2 network confirmations, whereas ETH deposits need 30 confirmations. After your deposit has been registered on the network, you will be able to track the progress of your deposit by refreshing the page. Your incoming deposit/s will appear on the right. Once your deposit has finalized, you’ll then be able to begin the exchange process. To start, navigate to the Exchange using the ‘Exchange’ button on the top bar. We recommend choosing the ‘Basic’ option unless you are an experienced trader. From here, select your trade pair on the right, by first selecting your base currency, e.g. either BTC or ETH, before scrolling down to find the correct Tron (TRX) trading pair. Select this to open up the trading options. Once this is done, you will be able to place a market order by selecting the market tab. Since you are technically selling BTC or ETH to get TRX, you will need to use the ‘Sell BTC’ or ‘Sell ETH’ section. Simply type in the amount of BTC or ETH you want to exchange for TRX, and click the sell button below. That’s it, you have now purchased some Tron! If you want more control over your order, you can instead use the ‘Limit’ tab, which will allow you to set the rate you will be happy to buy TRX at, and your order will be filled if TRX ever reaches this price. Bittrex is one of the oldest exchanges still in operation, and was founded in 2013 by Bill Shihara, Richie Lai and Rami Kawach as an advanced alternative to Mt. Gox. 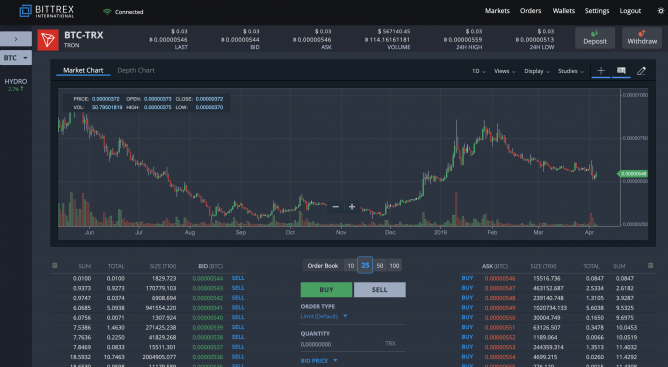 Being one of the most popular altcoin exchanges, Bittrex has found itself a fan-favorite thanks to the huge number of promising altcoins it supports, with well over 250 different cryptocurrencies available to trade. Currently, Bittrex offers four Tron cryptocurrency trading pairs, with TRX being tradeable against BTC, ETH, USDT, and also one of the very few exchanges to allow you to buy Tron with USD. Beyond its extensive digital asset and trade pair selection, Bittrex is also renowned for its flawless security record, featuring some of the most robust security practices of any modern exchange. 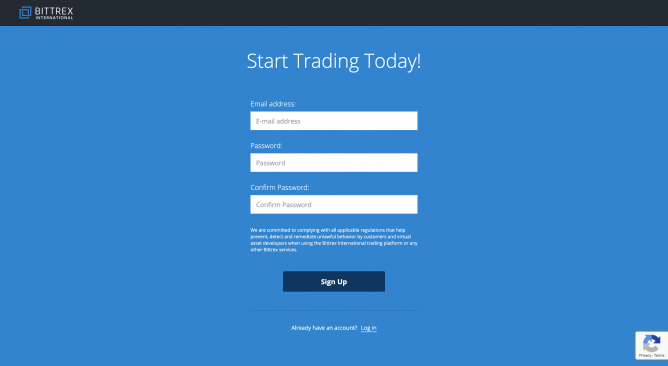 Like most cryptocurrency exchanges, creating an account on Bittrex is a simple process, taking just a couple of minutes to complete. To get started, head over the Bittrex website and click the big ‘Sign Up’ button. After this you will be asked to provide your e-mail address, and select a secure password to use. Once these are entered, click the ‘Sign Up’ button again to register your account. Once registered, you will receive a confirmation e-mail that you will need to confirm. 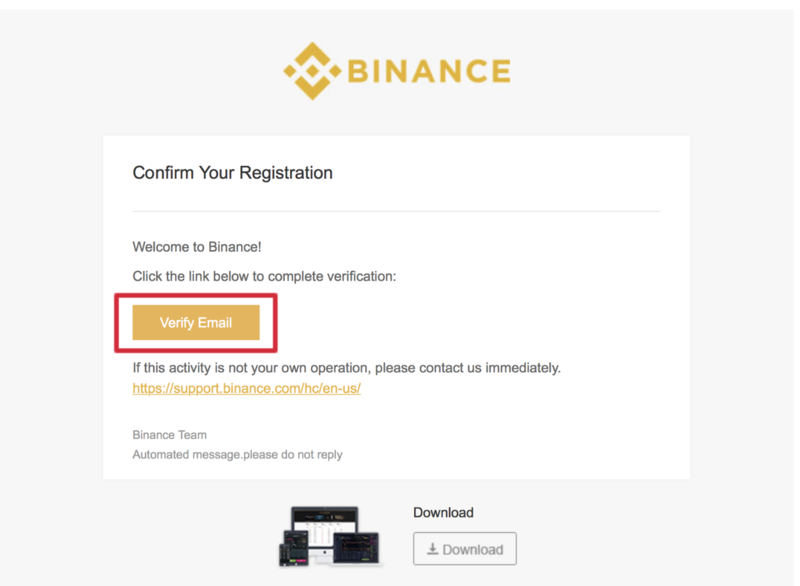 After confirming your account, log in and accept the terms of service, after this you will automatically be asked to verify your profile information and identity. Fill in your details such as name, birthdate and address as required, and continue to the next step, where you be asked need to provide your identity information. 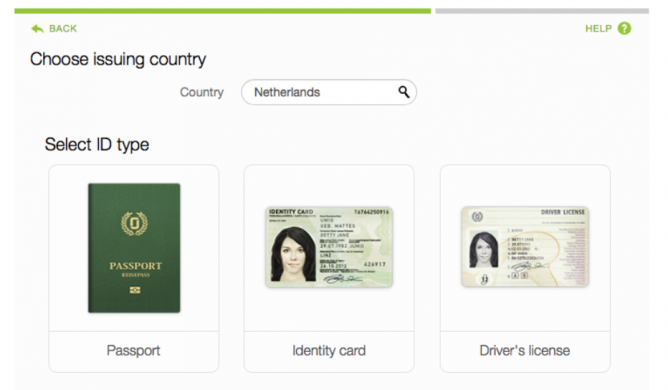 Here, you will need to provide a scan or photo of your passport, identity card, or driver’s license, as well as an image of your face to match the ID document. These documents will typically be verified within 10 minutes, after which you will be able to trade on Bittrex. Verified accounts will have a 1 BTC daily withdrawal limit, though this can be increased to 100 BTC per day by enabling two-factor authentication. After your account has been verified, you’ll then be able to access your deposit options, which are found in the “Wallets’ section of the website. 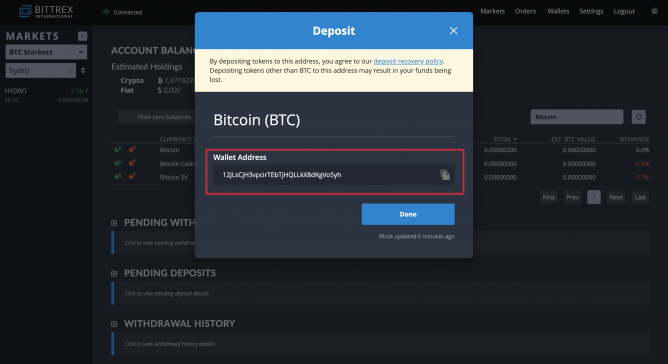 Here, you will be able to pull up your BTC and ETH deposit address. You can either scroll through the list to find BTC or ETH, or search either of these in the upper right search box to filter it directly. 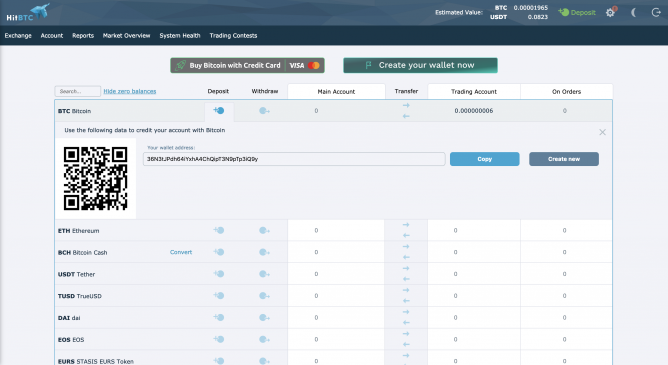 On the new screen that pops up, your BTC or ETH address will be displayed, this is where you send your funds from your external wallet. Typically, deposits will show in your Bittrex balance within 30-minutes or so, though can take longer depending on the network load. Now that you’re registered and have your BTC or ETH deposited, you’re practically done! 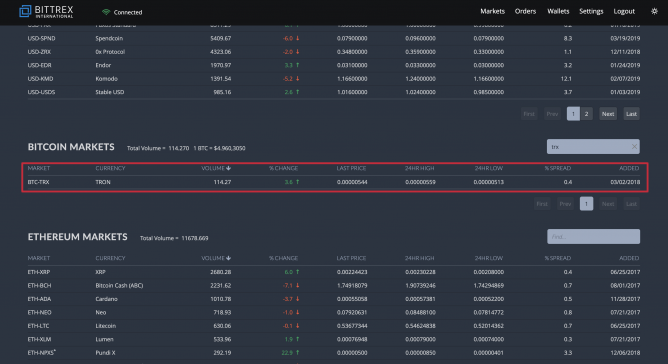 To complete the final step and place your Tron buy order, you will need to navigate to the ‘Markets’ tab shown below. 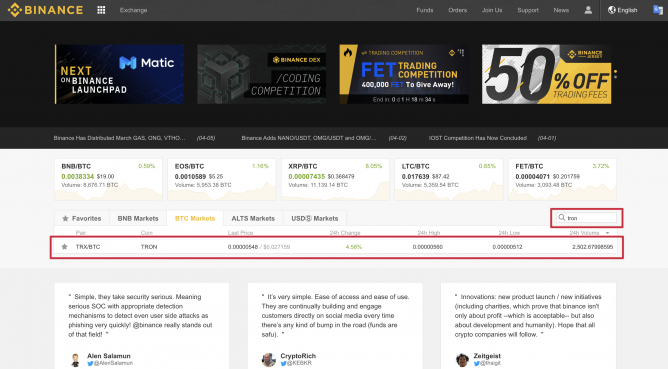 In the markets section, you’ll be presented with the four Bittrex base currencies, USD, BTC, ETH, and USDT. Depending on which cryptocurrency you deposited, you will need to scroll down to either the BTC or ETH section, where you will be able to search for TRX using the search bar above the market. After typing TRX, simply click the BTC-TRX or ETH-TRX option that shows up, which will take you over to the trading interface. 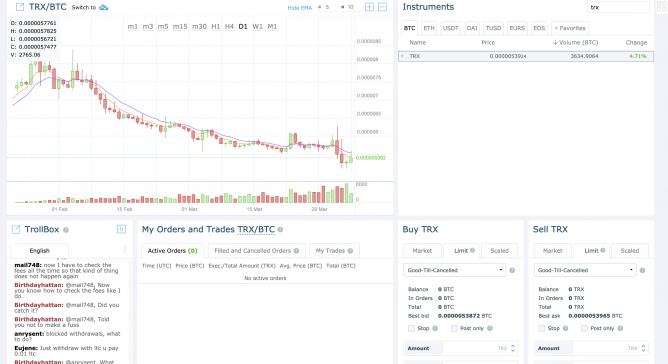 Here, you will be presented with the TRX trading chart, under which the buy orders will be displayed on the left, the sell orders on the right, with the trading options shown in between. In the trading options, click on the ‘BUY’ tab, make sure the order type is set at ‘Limit (Default)’. Now enter the amount of Tron you want to purchase in the ‘QUANTITY’ field, and set your bid price below. After typing these in, you will be shown how much BTC or ETH the order will cost, if you’re happy with this, click the ‘Buy TRON’ button to place the order. 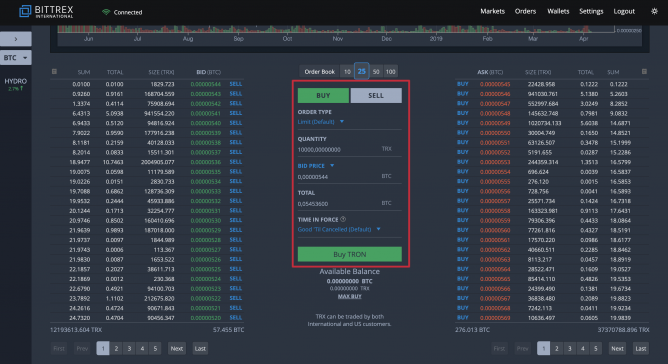 You can look at the sell orders on the right to determine which price to pay, if the price you enter is higher than the minimum ask price, then your order will probably be filled right away. Whereas if it’s lower, your order will be filled when the market reaches this rate. While Binance and Bittrex are excellent choices for most traders, they are certainly not the only great choices available. However, which option is best for you depends on a number of variables, such as your trading experience, payment options and how urgently you need to complete the purchase. Since exchanges can vary quite wildly in the trading fees they charge, as well as the amount of personal information required to complete a trade, it’s always a good idea to do some background research first. If you have ever used Binance before, then you will likely have no issues finding your way around Huobi Global, since the interfaces are very similar. Headquartered in Singapore, and launched in 2013, Huobi Global has become a popular exchange thanks to its user-friendly interface and fair trading fees. 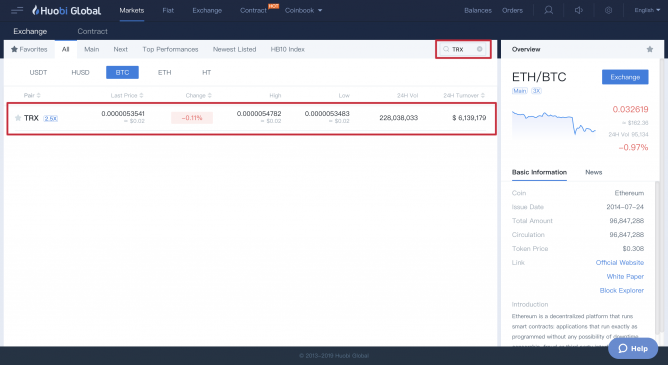 Besides this, Huobi Global boasts impressive liquidity for major cryptocurrencies, with its TRX/ETH and TRX/USDT trading pairs being particularly high volume. To purchase TRX on Huobi Global you will first need to create an account. To do this, simply click the ‘Sign Up’ button and complete your registration details. Once registered, you will need to complete identity verification. You can begin this process by hovering over your profile and selecting the ‘Verification’ option. Here you will be asked to provide your name and proof of identity, e.g. a scan of your driving license. After you have completed verification, head over to the ‘Deposit & Withdraw’ section under the Balances button. 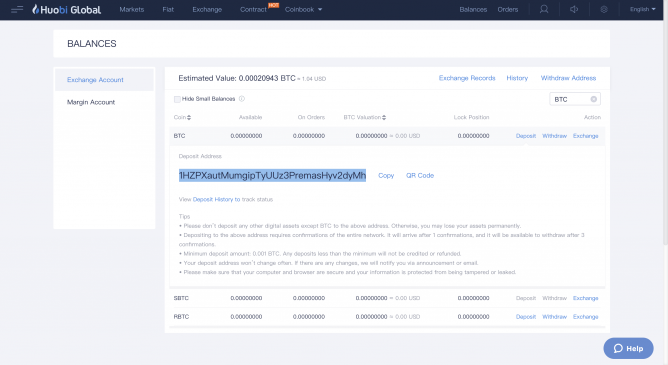 Since Huobi Global features USDT, ETH and BTC trade pairs, you will need to deposit one of these to address provided on this page. Lastly, click the ‘Exchange’ tab and search for your chosen market on the top left. 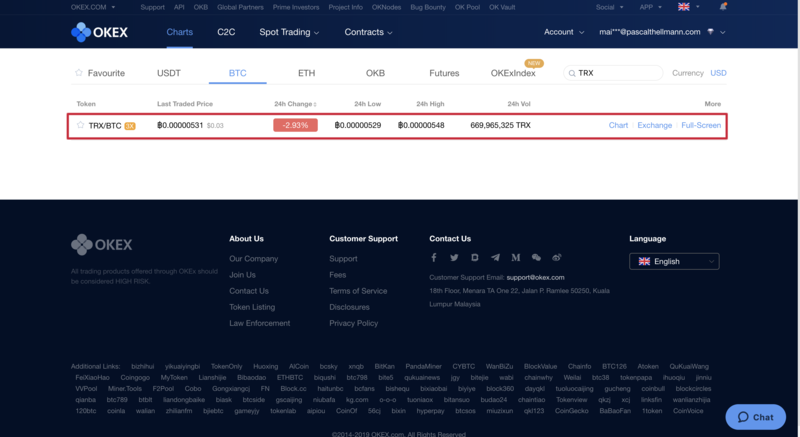 The trading panel will be displayed on the bottom right, allowing you to place your market or limit order for Tron (TRX). Now, simply click on the TRX pair, type in the amount of Tron you want to buy and hit “BUY TRX”! Since its launch in 2014, OKEx has been relentless in its growth, adding new popular cryptocurrencies on a regular basis, while becoming one of the first major exchange platforms to offer cryptocurrency futures trading. Currently in the top 15 exchanges by trade volume, OKEx offers excellent liquidity for major assets, with its Tron trading pairs regularly clocking in $5-$10 million in daily trade volume. 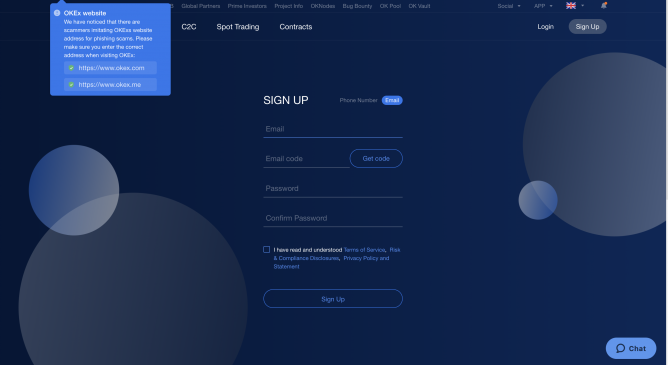 To purchase TRX on OKEx you’ll first need to create an account through the ‘Sign up’ button on the OKEx home page. After your account is created, head over the ‘Account’ button in the header, and select the ‘Deposit’ option. Search for USDT, ETH or BTC in the token search bar, and send your balance to the deposit address provided on screen. After your deposit has been confirmed, you’ll then be free to begin trading on the platform. To begin, select the ‘Charts’ tab, select the base currency, e.g. USDT, BTC or ETH, and then search for TRX in the search bar. Lastly, click the ‘Exchange’ button on your selected trading pair, and you’ll be presented with a variety of order types. For a limit order, select the ‘Limit Order’ option, enter your buy price and the amount you want to buy, then click ‘Buy TRX’ to complete your order! 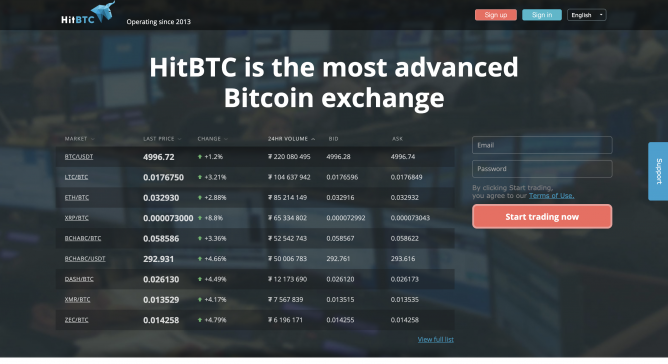 Widely considered to be among the world’s leading cryptocurrency exchanges, HitBTC has grown into an industry juggernaut since its launch in February 2014. With low fees, and extensive security options, HitBTC is an excellent choice for both casual and professional traders, while its extensive selection of supported cryptocurrencies leaves little to be desired. 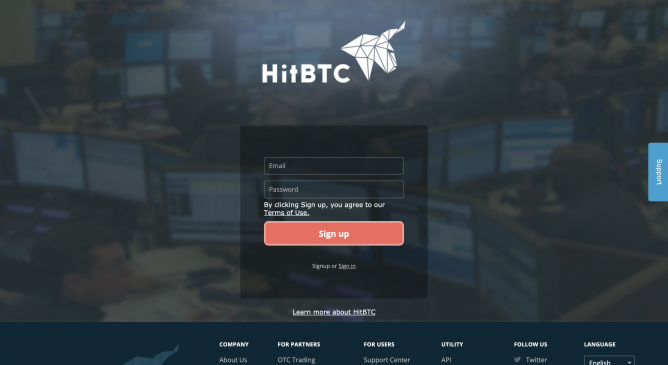 Available in most countries, and offering one of the most extensive feature-sets of any exchange, HitBTC is a solid choice for anybody looking to get involved in cryptocurrency trading. To buy Tron coin (TRX) on HitBTC, you’ll first need to create an account by clicking ‘Sign up’ on the home page and filling in the required information. Once registered and logged in, you’ll be able to load your account by finding your personal wallet addresses in the deposit section. 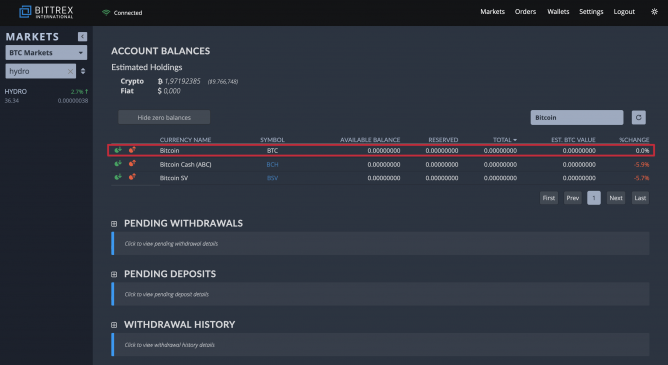 As of writing, HitBTC allows users to buy TRX with BTC, USDT, ETH and EOS, so you’ll need to deposit one of these first before trading. After this is complete, head on over to the exchange section and search for your desired TRX trade pair using the search bar on the right. This will pull up the options that allow you to either buy TRX at the market price using a market order, or set your desired Tron price using a limit order. Now simply type in the amount of TRX you want to buy and hit “Buy Tron”! Unlike the other options on this list, Changelly is not actually a cryptocurrency trading platform, but is instead a mediator that helps users buy and sell cryptocurrency without the hassles of dealing with a typical exchange. 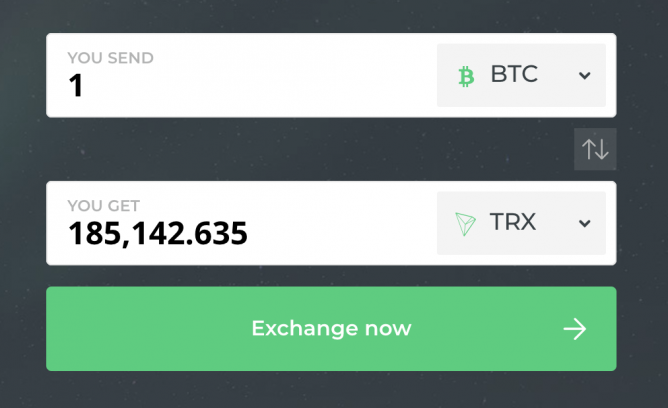 Since its launch in 2013, Changelly has become somewhere to buy Tron and other cryptocurrencies practically instantly, and thanks to its simple design and interface, the website is perfect for inexperienced traders. 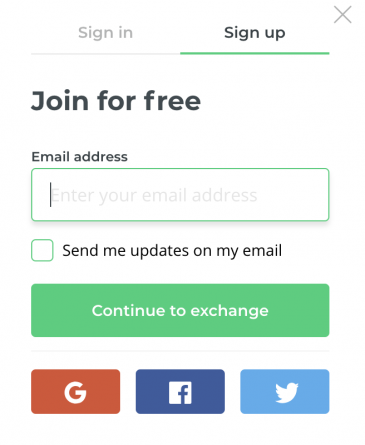 To get started on Changelly, you’ll first need an account. To create one, click the ‘Sign Up’ button on the home page, enter your e-mail and click the confirmation link you receive. Once logged in, you will be automatically taken to the exchange panel, where you will be able to select your base currency on the top — this is the cryptocurrency you want to exchange for Tron (TRX). After this has been selected, select TRX on the bottom selector. Enter the amount of TRX you want to buy, and you will be shown the cost just above next to your base currency. After your order details are correct, click the ‘Next step’ button and enter your TRX wallet address and click ‘Next step’ again. Alternatively select ‘Haven’t got a wallet yet?’ to create a TRX wallet. To finish up, proceed to the final step. Here you will be provided with an address to send your payment to. Once this has been sent, you’ll need to wait up to 30 minutes for the order to complete, with your TRX being sent to the address you provided earlier. Unfortunately, Changelly does not allow you to buy Tron with PayPal, though it is one of the few platforms that lets you buy Tron with fiat, thanks to its credit card support. After bursting onto the scene in 2017 with its blockbuster ICO, Tron quickly became a hit with cryptocurrency traders and developers thanks to its huge potential as a decentralized content ecosystem. The brainchild of cryptocurrency veteran Justin Sun, Tron was designed with the goal of transforming the global entertainment industry by providing developers with a blockchain that is fast, scalable and easy-to-use. Beyond this, Tron looks to decentralize the internet through its Project Atlas initiative, which will allow original content to spread across the new internet without restrictions. 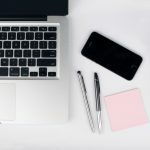 This new system will allow content creators to publish content and reach a direct audience, cutting out intermediaries and helping them better monetize their content. During the ICO, TRX tokens were sold for $0.0019 each. Since then, they have exploded in value, growing by over 1,000% since listing on exchanges, while obtaining an all-time high of almost $0.29/TRX in January 2018. According to Tronscan, Tron has garnered over 2 million registered addresses and has recorded over 100 million contracts, achieving close to 2 million transactions per day, making it one of the most active blockchains in operation. Since the launch of the Tron mainnet in May 2018, Tron has gone from strength to strength, particularly owing to its recent acquisitions. In July 2018, Tron acquired the hugely popular peer-to-peer file sharing network BitTorrent, extending its reach to perhaps hundreds of millions of users. More recently, in March 2019, Tron acquired CoinPlay, a decentralized blockchain app score, indicating Tron is again looking to extend its reach and distribute its services to more users. If Tron can truly deliver its product to 100 million plus users, and grow its ecosystem further, it is not unrealistic to expect huge potential gains from TRX. Beyond its huge acquisitions, Tron has also become known for ‘poaching’ decentralized applications (DApps) from other platforms, with several major Ethereum DApps uprooting and moving to Tron, including TronGoo (formerly EtherGoo), Everdragons and Blockchain Cuties — all thanks to the impressive speed advantages it offers over rivals. In addition, Tron has found support from several huge industry players, including Tether (USDT) — who recently launched a Tron-based version of their USDT stablecoin. It is thought that this move would make Tron more appealing to institutional investors, while increasing the liquidity of TRX. However, not everything has been smooth sailing for Tron, with blips popping up every now and then for the coin. For example, Tron has been accused of plagiarizing ideas from other projects, when it was revealed that much of its whitepaper had been copied from the likes of Filecoin and IPFS. Moreover, Tron CEO Justin Sun was criticized for reportedly faking his Twitter followers, after it was discovered that potentially thousands of his 1 million plus followers are actually fake accounts. According to reports, up to 40% of his new followers are fake — not great for publicity. In the end, Tron is still a relative newcomer to the DApp scene, and although it has had some success expanding its DApp ecosystem, it remains much smaller than competitors such as Ethereum. That being said, this can be mean that Tron has much more room for growth in the short-term, potentially being the better short-term investment. Now that we have already covered the best exchanges to buy TRX, it’s time to explore some of the best payment options that Tron can be bought with. So if you have questions like how to buy Tron with credit card or how to buy Tron with PayPal, then read on! Unfortunately, at the moment there is no direct way to buy Tron directly with debit card or credit card. That said, there is a small workaround that you can make use of! You can buy Tron with a credit or debit card indirectly by first buying Bitcoin on Coinbase with a credit or debit card, and then sending that Bitcoin to Binance in order to buy Tron. Just like with credit and debit cards, there also isn’t a direct way to buy Tron with a Bank Transfer. However, also in this case you can make use of a simple workaround. 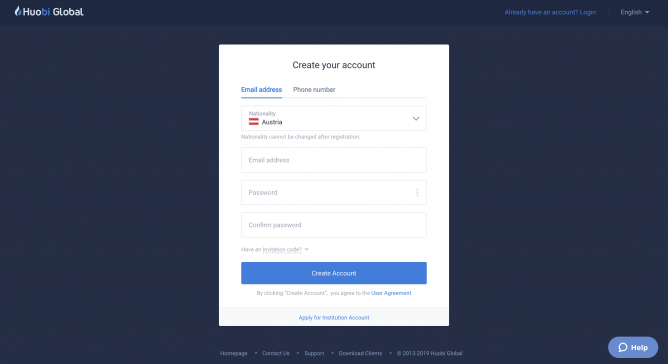 Simply deposit some USD, GBP or EUR on Coinbase with a Bank Transfer, use those funds to buy Bitcoin, and then send that Bitcoin to Binance and use it to buy TRX! The fastest way to buy Tron with PayPal is by making use of eToro. To do so, simply deposit some USD, EUR, or GBP on your eToro account with PayPal, head over to the “Tron Market” on eToro, and buy some TRX! To buy Tron with Skrill and Neteller, you need to make use of an exchange that accepts these payment options. One such exchange is CoinGate, where you can easily deposit up to 2,000€ with Skrill and use those funds to buy Tron directly. What is the best exchange to buy Tron at? After buying Tron, the next step is to find the best TRX wallet so that you can store your coins safely. In essence, you have two main options: hardware wallets and software wallets. A hardware wallet is the safest way to store your TRX, since it’s a highly secure physical device that cannot be compromised. The two best hardware wallets are the Ledger Nano S and Trezor One. We compared them both so make sure to check that out if you want to store your TRX on a hardware wallet. The second option to store your TRX safely is to use a software wallet. Although software wallets are less secure than hardware wallets, they’re usually easier to use and hence a better option for beginners. The 2 best TRX software wallets are the Huobi Wallet and Trust Wallet, both are recommended on the official Tron wallet page.